What tastes better, a $30 bottle of wine that’s the cheapest the restaurant offers…or the very same bottle at the restaurant next door, where it’s the most expensive? What offers a better education: four years at your first choice selective college? Or four years at the same place, but it’s your last resort safe school, after you’ve been rejected by more famous (and thus selective) schools? When asked about our experience, the essential question is always, compared to what? I was surprised that some of my classmates disagreed – the ones for whom Wheaton was a safety school or a last choice. Some of them hadn’t gotten in to the places they wanted to go and so their parents essentially bought them a slot at Wheaton. Our experiences that first year were very different. They were comparing our quiet campus with the places their friends enrolled: big football schools with raucous fraternity/sorority systems and lots of parties. I was thankful to be in a quieter place where it was cool to be smart, where I could get my feet underneath me academically. I couldn’t be wildly social and academically focused; I didn’t have it in me. And I’d partied plenty in high school. Had I gone to a bigger school with a more “traditional” college experience, I think I’d STILL be there, playing quarters at some party and trying to finish up a few more credits for a degree in something I didn’t even care about. That was the direction I was headed in coming out of high school, and I needed a stark change of atmosphere to turn me around. As Godin points out, when asked about our experience, the essential question is always, compared to what? I think being aware of our comparisons is helpful when we find ourselves drawn to something and think “If only I had THAT…or if THIS happened…or I did X…life would be good!” We might be right. I was right about Wheaton – life was better once I got in. But I think it’s helpful to look at the substance of our longing and ask, What am I comparing this to that makes me believe it will make a difference? Am I longing for the $30 bottle of wine at the top of the menu pricing because I think I’ll enjoy the flavors more than the other available wines? 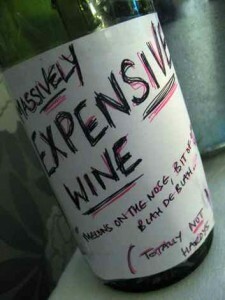 Or is it the satisfaction of appearing well-off and magnanimous that I’m after, and I’d never think to order this same bottle at the restaurant next door, where it’s the cheapest thing on the menu? Whenever I’m interested in something because I’m imagining the positive way other people will respond to me because of it, I’m in a world of hurt (that’s New England speak for Big Trouble Coming Your Way). I’m comparing me and whatever I had before – for example, a boring, normal car…to me with a FANCY SPECIAL car, believing that the FANCY and the SPECIAL are transferable. And perhaps they are. But I think it helps to be aware of what you’re hoping for, so that if you end up disappointed, you can say, “Oh, okay. I guess cars can’t deliver on that they way I thought they could” and begin a conversation with God about why it feels like FANCY and SPECIAL are so desirable, yet so elusive. God tends to have the right shaped pegs to fit the big holes in our lives. This entry was posted in Perspective and tagged Seth Godin, Wheaton College on September 23, 2013 by Trish Ryan.